The Cabinet Ministry has taken another step towards the employment generation last Tuesday. Prime Minister Shree Narendra Modi has approved the scheme for the young generation of the nation to develop their training and skill to acquire more jobs in the future. 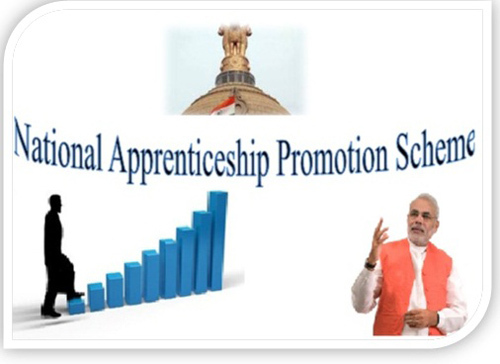 The National Apprenticeship Promotion Scheme has launched to support over 50 lakh young people to develop their skill and to train them for their future job profiles. The ministry has allocated Rs. 10, 000 Cr for this project. The scheme on the other will commercially enhance the training centres that are currently involved in professional training and skill development activities across the country. What is National Apprenticeship Promotion Scheme? By Apprentice training we mean the skill development training that workers need apart from any bookish knowledge. From earlier times India stands out to be one such nation that has less number of skilled work forces. Apprenticeship Promotion Scheme will allow the young work force to acquire more skill by getting professional training classes and attending workshops. This scheme has launched to promote the skill development training that is much needed in the country like India. Under National Apprenticeship Promotion Scheme over 5 million students will get such training in various training centres. Currently the number of students who are getting such training is 2, 30,000. The government of India is planning to increase the figure to 5 million by the end of the year 2019-20. As mentioned that in India there are very less workforce that are properly skilled in any field. However the education system allows them to acquire high degrees but unfortunately due to lack of proper skill they fail to compete in global market. The sole purpose of the scheme is to provide adequate and necessary skill development training to millions of young people across the country. Also the stakeholders of the training centres will also get benefitted as the government will be funding 25% of the total training cost. As a whole the purpose of the scheme is to provide skill development training to the young generation and providing financial benefits to the training centres. The scheme is to promote the apprentice programmes and training in India. Union Ministry of Skill Development and Entrepreneurship has launched and implemented the scheme for the young generation of the nation. Under this scheme nearly 5 million people will be eligible to receive the skill development training to acquire more competitive jobs in future. The training programs will be held in several training institutions across the country. The government will bear 50% of the total cost of training and also share the 25% of the stipend given by the training organisation. This will definitely bring down the financial burden of the centres. As per the rule of the scheme, 25% share of the stipend given to each apprentice will be borne by the government of India. As for example if an apprentice is getting Rs. 5,000/- as stipend then 25% of the amount i.e. Rs. 1250/- will be borne by the government and the rest amount will be borne by the company. This will lower down the financial burden from the company. They will get the 25% cash back from the government. The scheme will cover 5 million apprentices by the year 2019-20 which is more than Germany which has 3 million currently. In China the rate is 20 million. To keep up with other countries in the world India must have had such schemes. The scheme will not only be benefitted for the apprentices but also it will lead to commercial advantage for the companies. According to the guidelines of the scheme the government will bear the 1/4th of the stipend given to the apprentice by the company. Company can reimbursement the 25% of the stipend later. With launching the scheme the exposure of the skill development has become broader for the young generation of the country. They will be acquiring globally competitive training from the training institutions and companies to match up the world class competition. With the scheme launch there will be more job opportunities for the eligible people as now onwards they will be more trained and skilful. The scheme will integrate the skill development training and entrepreneurship in a much better way. The National Apprenticeship Promotion Scheme will be implemented by the Director General of Training (DGT). The scheme will be supervised by the Union Ministry of Skill Development and Entrepreneurship. By the end of the year 2019-20 the scheme will be able to cover 5 million apprentices across the country. The government of India will be allocating Rs. 10, 000 Cr for the scheme. They will bear the 50% of the total cost of training on the one side and on the other they will be providing 25% of the stipend given to the apprentice by the company. The government as a whole will contribute in not only the training but also will provide commercial benefits to the companies. The government of India has planned to start new training centres and other facilities under the scheme so that the apprentices will get more opportunities to develop their skills. As mentioned under the scheme government will bear the cost of the training (half) and share the stipend (1/4th) the central government has also planned to provide skill development training directly to the apprentices in future through professional training centres. It is aiming to become one stop solution for the skill development training programmes. It will be catalysed the entire ecosystem of the skill development in the country. The scheme has launched on 5th July 2016. Ravi Shankar Prasad has launched the scheme under the supervision of the Cabinet Ministry in New Delhi. The central government has announced the launch of the new NAPS (National Apprenticeship Promotion Scheme) – 2018. The new scheme is a type of scheme run by the central government on national platform. Under the new scheme the youths of the country will be provided with skills development training porgramme for PMKVY students/ MES Graduate students/ Fresher’s/ ITI students. Under the new scheme the government has announced to provide candidate with apprenticeship and stipend. The new initiative has been taken by the government for the Youths of the nation. As a part of the scheme the government has announced to offer with 25 percent of the overall stipend. Apart from this the government has announced to provide with a monthly apprenticeship of Rs 1500 to each candidate registered under the scheme. The provision for registration can be made by filling in details on the application form available at the web portal. The apprenticeship will be offered to the employers by the government for being a part of the programme. The government has also stated that it shall be offering training providers with incentives for the cost of training equivalent to Rs 7500 for three months. The incentives will be covering a training time of 500 hours for each apprentice. Under the new initiative the government expects to offer coverage to over 50 lakhs youths nation wide by 2019-20. The programme is run officially under the tag line “Kaushal Bharat- Kushal Bharat”. Interested candidates who wish to be a part of the training programme will have to visit the official website at apprenticeship.gov.in. Once on the main page you will have to look around for “Apprentices” option. Then you will have to make the selection of the “Registration “ option as candidate. You can also visit the official page by clicking the link at http://www.apprenticeship.gov.in/Pages/Apprenticeship/ApprenticeRegistration.aspx. You will be redirected towards the registration form page where you will have to enter all your details asked. You have to provide details for NAPS 2018 and then “Submit” the application form. Once registered you can also view the status of the profile by visiting the official website or clicking the link at http://www.apprenticeship.gov.in/Pages/Trainee/Authentication.aspx. Using the above mentioned apprenticeship practice the government can help develop formal training method that is effective, practice oriented and industry led. Using the new initiative the government aims at creating a new trend for offering apprenticeship programme under NAPS 2018. You can check with the eligibility and other details at http://www.apprenticeship.gov.in/Material/NAPS_Benefits.pdf. Any candidate who is interested can also get registered to the official scheme by visiting the link at http://www.apprenticeship.gov.in/Pages/Apprenticeship/EstablishmentSearch.aspx?IsApply=1. You will be redirected towards the online registration form. In order to apply applicants will also have to provide a copy of their Bank account details and Aadhar cards.